From the very beginning, “American Hustle” announces that it is only sort of based on true events. Fitting, as this is an historical event so complex and bizarre that the whole truth simply could not do it justice. This is where movie truth steps in and offers a helping hand. 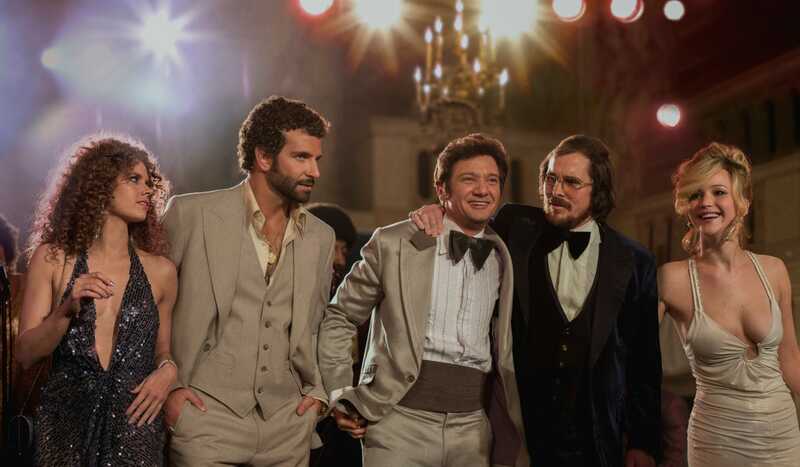 “American Hustle” constantly blurs the line between real and fake. In fact, the film opens with Irving Rosenfeld (Christian Bale) giving himself the most passionate combover you’ll ever see. Irv’s life philosophy is to fake it until you make it. He kind of has to, as this is part of his job: Irv is a con man, and a very good one at that. From there, “American Hustle” is like a much better version of “The Informant!” crossed with “Goodfellas” on crack. Once Sydney Prosser (Amy Adams) enters the picture, the film is a manic mix of criss-crossing voiceovers and flashbacks. The two of them try to commit the perfect crime, yet they have trouble doing this, as they are not the perfect couple. That is exactly why it is easy to get attached to these people, but especially Irv, as he does not look like a slick member of the “Ocean’s 11″ crew. Rather, he resembles a schlubby Ron Burgundy knockoff. The other characters are crime movie misfits as well. Set in 1978 during the ABSCAM Scandal, ambitious FBI Agent Richie Dimaso (Bradley Cooper), who tries to use Irv and Sydney to bring some powerful politicians down, is terrible at his job. Meanwhile, Irv’s manipulative wife Rosalyn (Jennifer Lawrence) is all too aware of her husband’s misdeeds. The only character who actually acts like a real criminal is Sydney. Lesson learned: being able to fake a British accent is a very useful skill in the world of con artistry. The difference between “American Hustle” and most heist films is that the twists here are actually surprising. Leave it to director David O. Russell, who has also added new spins to the war movie (“Three Kings”), the sports biopic (“The Fighter”), and the romantic comedy (“Silver Linings Playbook”) as well. Nobody manipulates form quite like he can. While David O. Russell is a uniquely talented director he is also fortunate enough to be working with such interesting material. The characters here are so well fleshed out that they each deserve their own miniseries. Much of O. Russell’s work has been focused around people who call each other out on their BS. “American Hustle” is no exception (consider this elegant and stinging putdown: “she was a master at passive aggressive karate”). O. Russell and co-writer Eric Singer have come up with some great one-liners here, but the cast truly brings the words to life in a way that, well, actors are supposed to. The fact that “American Hustle” was shut out of the SAG Awards is a travesty that should have ended awards season. Irv is one of the most interesting criminals in any movie in years. As Sydney says when she first meets him, Irv doesn’t look like much, but his confidence takes him a long way. He may be a professional liar, but he just wants people to accept him for who he is. Irv is the most authentic faker out there. There was no better choice to play him than Christian Bale, who lovingly portrays him while hiding behind a big paunch and a garish Star of David necklace. While Bale probably could have done it all on his own (I’d like to think that one day he’ll get his own “Nutty Professor II: The Klumps”), he gets a lot of help from a fantastic array of supporting actors and actresses. While “Silver Linings Playbook” co-stars Bradley Cooper and Jennifer Lawrence don’t get much screen time together, they both get a lot of milage out of playing against type. As Richie, Cooper gives the sense that this guy is thinking at an ADD pace, and this is exactly what stops him from ever doing or saying the right thing. Meanwhile, Lawrence plays Rosalyn who has been holding her rage back for far too long and now she just can’t take it anymore. Perhaps she just watched “Network.” She would rather let a microwave explode than have to listen to her husband tell her how to properly cook something. It’s hard for anybody to get a word in when Rosalyn is around, which plays quite nicely with Lawrence’s outspoken public persona, and is a fitting personality trait for just about every loud New Yorker out there. When they are all together, the ensemble plays like a great band during their finest concert. Hitchcock once said (and Roger Ebert has also cited in a review) that he enjoyed “playing the audience like a piano.” “American Hustle” enjoys doing the exact same thing, except this time it has dismantled the piano so much that the movie plays itself as much as it plays the audience. The film gets confusing and convoluted beyond belief at times, but then it backtracks and reverses until it ultimately reaches an immensely satisfying finale that asks the viewer to be skeptical of everything that just occurred. Finally, a movie that understands that history is much more interesting when you look at it from a completely different, or even wrong, perspective. Once it ended, I felt like I could have sat through it once more. “American Hustle” is a smart summer movie wrapped in a December Oscar bait shell. Here is a film about a long con that is also one big long con. I tried to keep as much plot detail out of this review as possible. While much of the story has been altered, the less you know about ABSCAM, the better. It is definitely worth a good Wikipedia search afterwards though. I hope that the film’s likely success doesn’t create a sudden disco nostalgia craze. Please, everybody is still distracted by 90s nostalgia! No matter how brief his appearance was, seeing Robert De Niro play a gangster again delighted me to no end. More of this and less “Last Vegas,” please. Louis C.K. has had minor roles in two of my favorite films of the year from two of my favorite directors. Luckily, he gets a bit more screen time here than he did in “Blue Jasmine.” He plays hilariously timid so perfectly. He doesn’t seem like a typical FBI guy here. But then again, most of the government agents here are very against type. Funny how the criminal is more sympathetic than the FBI agent here. Guys, anti-heroes are the greatest. For some reason, I have expected Kyle Chandler to show up as “Authority Figure #000003″ in just about every Oscar prestige movie now. Couldn’t believe he wasn’t in this at all. Come on, somebody get Coach into comedy! Jeremy Renner pulls off a good Elvis hairdo, and a convincing New Jersey accent to boot. 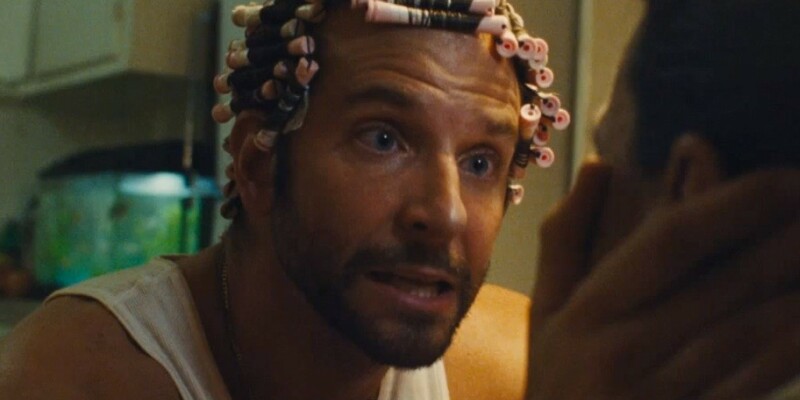 There are few things in this world funnier than the site of Bradley Cooper with curling irons in his hair. A David O. Russell movie without any Led Zeppelin on the soundtrack. AND it’s set in 1978? What is the world coming to??!! Speaking of music, there is a scene where Jennifer Lawrence sings along to a song. I will not spoil it any further, but I will say that it is a moment that her entire career has been leading to. I really want to hear how that ice fishing story actually ends. But you know Richie, whatever sounds best in his head works for him. It’s okay, JLaw. You’re still America’s sweetheart. This entry was posted in American Hustle, Amy Adams, Bradley Cooper, Christian Bale, David O. Russell, Jennifer Lawrence, Jeremy Renner, Louis C.K., Movie Review, Robert De Niro on December 21, 2013 by ian0592.